Arranged by Various. Method/Instruction; Promotional Packet. 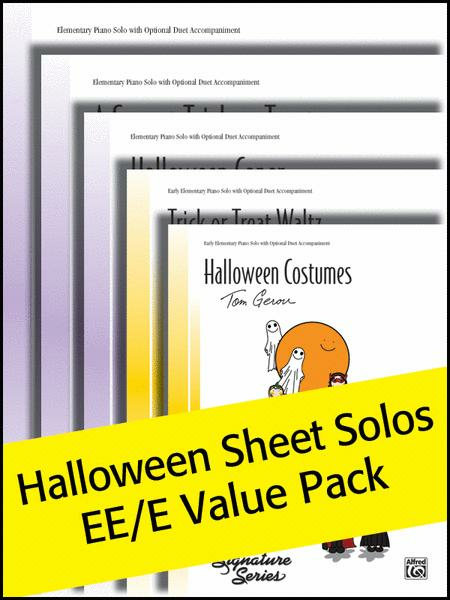 Halloween Sheet Solos. Other. Alfred Music #00-105479. Published by Alfred Music (AP.105479). 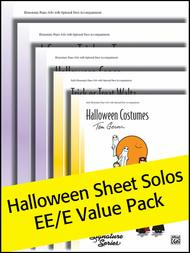 This Value Pack includes five original Halloween sheet solos at the elementary level. Titles: Halloween Costumes (EE) by Tom Gerou * Trick or Treat Waltz (EE) by Gayle Kowalchyk * A Sweet Trick or Treat (E) by Carol Matz * Halloween Caper (E) by Melody Bober * Skeleton in My Closet (E) by Wynn-Anne Rossi. Alfred Value Packs are a great way to introduce yourself to new music from many of the top names in educational piano. These specially designed sets allow teachers to review the music to determine the best use for their students. Limit one per customer.